We all have mountains of scrap pieces of patterned paper lying around. This layout shows one way to start using some of them up while still creating gorgeous pages for your albums. This layout was created using scraps of patterned papers (I used mostly pink, green and brown Sassafras Lass and Chatterbox papers), black cardstock and Creative Imaginations Love Epoxy stickers. Use a sheet of black cardstock for your background. This helps to ground your page. Adhere your photo towards the top right section of the page. I recommend using a 5x7 photo for this so it stands out. 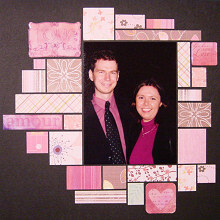 Cut various sized rectangles from your scraps of patterned papers and start positioning them around your photo. Do not glue them down until you are happy with their arrangement. Have some fun and play with this part. There is no right or wrong way to arrange your papers. Make sure you leave room for your Creative Imaginations Love Epoxy stickers. These help define the mood of your page and act as a title. When you are happy with your arrangement, glue everything down.